Without the tour players, the PGA of America became primarily an association of club professionals, but retained control of two significant events; the PGA Championship and the Ryder Cup. The former was an established major championship, but the latter was an obscure match play team event which was not particularly popular with golf fans, due to predictable dominance by the United States. With the addition of players from continental Europe in 1979 and expanded television coverage, it became very competitive and evolved into the premier international team event, lately dominated by Europe. Both events are very important revenue streams for the PGA of America. Historically known as the "Canadian Tour", it was taken over by the PGA Tour in November 2012. The 2013 season, the first under PGA Tour operation, began with a qualifying school in California, followed by nine tournaments in Canada. Non-members can play their way into the PGA Tour by finishing the equivalent or better of 125th in FedEx Cup points. Those who fail but fall within the top 200 in current season points are eligible for the Web.com Tour Finals. During the season, non-members can earn Special Temporary Member status by exceeding the equivalent of 150th in the previous season's FedEx Cup. Special Temporary Members receive unlimited sponsor exemptions, while non-members are limited to seven per season and twelve total events . The PGA Tour maintains a priority ranking system that is used to select the fields for each tournament on tour. Below is the 2016–17  ranking system, in order of priority. World Golf Championships (WGC): A set of events co-sanctioned by the International Federation of PGA Tours which attract the leading golfers from all over the world, including those who are not members of the PGA Tour. Note that the HSBC Champions was made a WGC event in the middle of the 2009 season. Because it takes place after The Tour Championship, it does not currently count as an official money event or an official win, but the winner is invited to the following season's edition of the winners-only Hyundai Tournament of Champions. Beginning in 2010, if the winner is a PGA Tour member, the victory will count as an official win and the winner will receive a three-year Tour exemption (as with other WGC winners). Once the PGA Tour changes to an October–August season in 2013, the HSBC Champions will become an official money event, and victories will be official for PGA Tour members and non-members alike. The criterion for retaining tour cards at the end of the season also changed. Through 2012, the top 125 players on the money list at the end of the PGA Tour season retained their tour cards. For the 2013 season only, the top 125 players on both the money list and the FedEx Cup points list at the end of the FedEx Cup regular season in August retained their cards. The tour also said that it would decide at a later time whether to keep this aspect of the qualifying system in place in future seasons. Otherwise, the planned move by the tour to have the top 125 players on the FedEx Cup points list retain their tour cards took effect with the 2014 season. The next 75 players on the points list, along with the top 75 on the money list of the Web.com Tour at the end of that tour's regular season, are eligible to play a series of three tournaments in September known as the Web.com Tour Finals. The Finals field, however, is not expected to consist of all 150 players, as some of the PGA Tour players will be exempt by other criteria, such as a tournament win in the previous two years. A total of 50 PGA Tour cards for the next season is awarded at the end of the Finals. The 25 leading money winners during the Web.com Tour regular season receive cards, and total money earned during the Finals determines the remaining 25 card earners. For all 50 new card earners, their positions on the PGA Tour's priority order for purposes of tournament are be based on money earned in the Finals. College players who turn professional can enter the series if their earnings are equivalent to a top-200 PGA Tour or top-75 Web.com Tour finish. PGA Tour players compete for two player of the year awards. 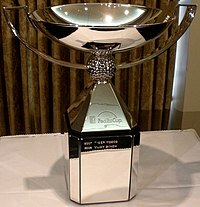 The PGA Player of the Year award dates back to 1948 and is awarded by the PGA of America. Since 1982 the winner has been selected using a points system with points awarded for wins, money list position and scoring average. 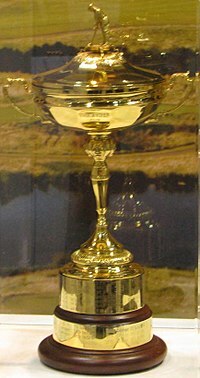 The PGA Tour Player of the Year award,  also known as the Jack Nicklaus Trophy, is administered by the PGA Tour and was introduced in 1990; the recipient is selected by the tour players by ballot, although the results are not released other than to say who has won. More often than not the same player wins both awards; in fact, as seen in the table below, the PGA and PGA Tour Players of the Year have been the same every year from 1992 through 2018.